Q4FY18 was a wild quarter for our portfolio. We lost ~ -6.36% on the portfolio against a - 3.96% fall in the value of the Nifty index between 29 December 2017 and 28 March 2018. This was an under-performance of 2.4% and this is first quarter of under-performance from our side. For new investors, the allocation to equities is 45% to 50% and for those associated with us since end of 2016, the allocation is now touching 80%. This was a tough quarter for the markets and PC Jewellers was a big reason of our under-performance despite having a very low allocation. As you can see, there was a wild swing in our portfolio from it's peak in the 2nd week of January to it's lows in the 3rd week of March. 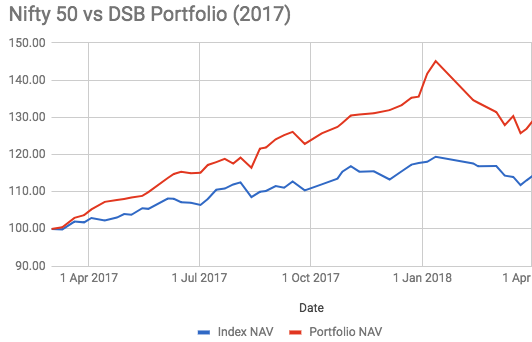 Our overall portfolio drawdown was 13.18% vs the Nifty's drawdown of 10.72%. If your portfolio fell by more than 20% in this fall, you should be concerned about the risk profile and health of your portfolio. We are also satisfied that our portfolio has risen back faster than the broader market.